While Steve Jobs has already been depicted several times on film, I think it’s fair to say that Universal Pictures’ “Steve Jobs” is the Big One. At least for now. 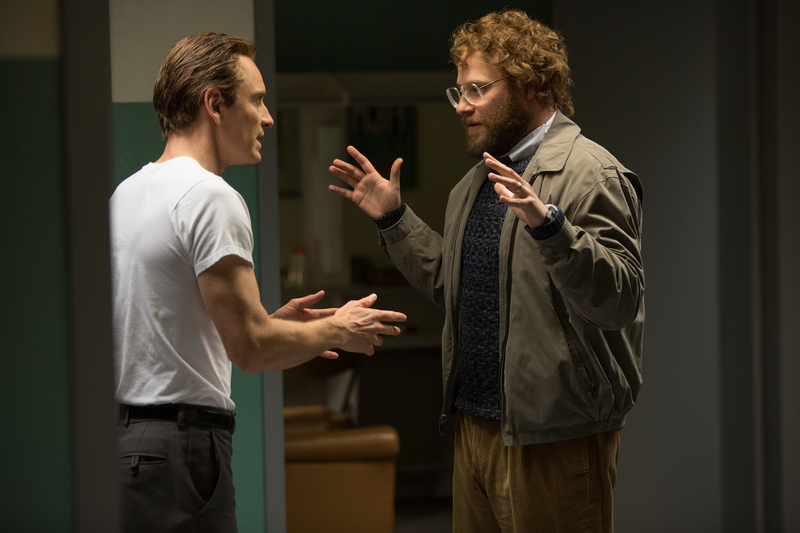 The movie is based on Walter Isaacson’s Jobs biography, with a writer and director who have both won Oscars — Aaron Sorkin took home Best Adapted Screenplay for “The Social Network,” while Danny Boyle won Best Director for “Slumdog Millionaire.” And it stars Oscar-nominated Michael Fassbender as Jobs. I talked with Sorkin and Boyle over the weekend to hear more about their take on the man who is probably the tech industry’s most iconic figure. For his part, Boyle said he was attracted by Sorkin’s script, particularly its unconventional structure. Instead of covering Jobs’ entire life, it focuses on three moments, taking us backstage before the launch of the original Mac, the NeXT computer and the iMac, after Jobs returned to Apple . And it highlights Jobs’ tumultuous relationship with his first daughter Lisa Brennan-Jobs. Since there’s already been some back-and-forth about those comments, I didn’t ask about them specifically. However, both men talked about Jobs’ shortcomings (or perceived shortcomings) while also speaking admiringly about his products — for Sorkin, the two things are linked. Read an edited transcript of our conversation below. TechCrunch: Given that Steve Jobs has been portrayed and written about in so many different ways, what was it that attracted each of you to the project and made you feel like there was something fresh to say? 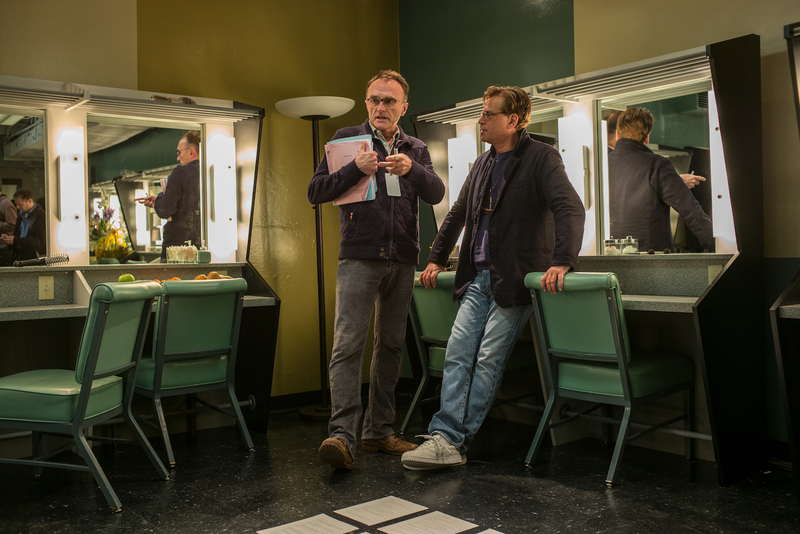 Danny Boyle: For me, it was the script. I mean, I knew a bit about him, I didn’t particularly want to make a film about him. [The script] was just this extraordinary way of approaching him — that it wasn’t a biopic, yet it felt like we learned so much about him. I knew how significant he was in terms of our changing world, but this approach to him was so outrageous and clever and satisfying and also emotional. I loved the father-and-daughter thing. Aaron Sorkin: For me, I didn’t know much about Steve Jobs at all, beyond the bullet points of his résumé, and they came to me with Walter’s book. [Jobs] had just died just a couple of weeks before, and the way he was eulogized by the entire world, it was the same as when John Lennon was killed. So my curiosity was — obviously, this man means a lot to a great many people. I want to find out what this is all about. Then you get into Walter’s book, you begin reading [about] the contradictions, the conflicts, the strange behavior that’s difficult to explain, but as a storyteller you want to explain it if you can. TechCrunch: At the end of the project, do you feel like you have a good sense yourself of why people are so interested in Jobs? Sorkin: I feel like I have a better sense going the other way. Which is to say this: I know I, myself, have often felt like I’d be best off if I could live in a room by myself, and I could slip script pages under the door, and if somebody could just slip me a tray of food back — that’s how I would want people to know me, from the things that I write. That would be better than meeting me in person, where I don’t get to do a rewrite on myself. And I think that deep down, Steve felt himself to be flawed. Or as he says in the third act, that he’s poorly made — just irreparably flawed and perhaps unworthy of being loved or being liked. However, he was able to make these products that weren’t just useful, they weren’t just successful, people loved them. People had these relationships with them, as you point out. He understood how to build those into the products, that it’s better having rectangles with curved edges, or as he says, “Look, the Macintosh resembles a friendly face and the disk slot is a goofy grin.” If you could love his products the way people do, and that’s why he was eulogized the way he was, that stood in for the kind of human contact that he didn’t think he was capable of. If you stood in the way of him achieving that, if you thought it was silly to have rounded corners, or silly to spend this much memory on fonts or things like that, he’d cut you to ribbons, because you were standing in the way of him presenting his best self to the world. TechCrunch: One thing I found interesting about the movie was opening with the Arthur C. Clarke footage, where Clarke speculates about how computers will affect society. It gets at this idea that there’s something about understanding Jobs that’s tied to understanding our relationship with technology. Danny, from your perspective, did you feel that those two things are closely linked? Boyle: We wanted to give a glimpse, because obviously for a lot of people watching this now, a computer is a completely friendly, personal, you know [points to my MacBook] it sits on your lap, it’s warm, you feel it, it’s in your pocket. It’s like part of you, and it’s becoming more and more a part of you. [Jobs] made that change, because before, they were worrying things, weren’t they? And it wasn’t just Hollywood. [To Sorkin] You say Hollywood made us fear these things, but it was also genuinely a thing that they were hard edged, they were cold, impersonal, they were powerful, maybe they’d overtake us … It was all that kind of stuff, and we just wanted a little reminder of that. That footage brought a visionary actually describing the way it could become. But a room full of a computer was a wonderful starting place, to throw you back in time and also show you where Steve is starting from. Sorkin: One of my favorite moments in the movie, I can say this because I didn’t write it, is in that archival footage. It’s the pause that Clarke takes after he’s rhapsodized about, “Here’s how your son will be living, he’ll have a computer in his home, this is how he’ll buy his movie tickets, this is how he’s going to talk to his friends.” And the boy’s father says, “What will happen to his social skills?” There’s just a pause where you feel like [Clarke’s] never thought of that before. TechCrunch: Portraying the personal side of Jobs’ life and his relationship with Lisa — it makes for a more dramatic, more interesting and satisfying movie, but do you feel that there are also ways that it connects to the broader questions about technology? Sorkin: Well, Steve’s demand to have end-to-end control was always for me a metaphor for his own life, a lack of control that he felt because of his adoption situation. And again, if your thing is, I’m going to make a product that you feel that you’re going to have a relationship with, [then] I don’t want you to be adding things onto it that could ruin it. TechCrunch: Was there anything in particular that made you feel like Michael Fassbender was the right person for the role? Boyle: If you watch his work, there is something very Jobsian about him. He is completely uncompromising. What Aaron was saying about, if you got in the way of Jobs’ vision he would just eviscerate you, there’s something about that with Michael. I think in his performances, he reaches something that is his aim; he’s got this vision of it, and he’s going to go uncompromisingly towards it. The things that studios demand, like likeability — [laughs] especially in unlikable scenes they would like a bit of likeability — is not going to play any factor. For us, dealing with a character like this, if you soft-pedaled Steve Jobs, you would rightly be thrown out of the door. Because there’s enough people who have been witness to his behavioral patterns, who can say, “You have soft sold him.” You’re never going to get that with Michael. The other thing he does, and it’s because of that uncompromising thing, is that if you’re prepared to join him, he’ll take you on a journey as an actor. He’s a lead actor in that sense. It’s not about a huge charm, it’s actually about a kind of journey you’re going to go on, which is going to make him unrecognizable, even though he doesn’t physically change. We don’t use prosthetics or stuff like that. He does this in all his work — by the end he’s changed, and you’ve gone with him on that change. [To Sorkin] It was amazing, wasn’t it, when he got to the third act, because he’d kind of fought, I’m sure it was the size of the part, but by the time you got to the third part, he would come into the set and be off. You could have written hundreds of pages more for him and he would have dealt with it. He was on it by then, it was incredible, and I think the crew always felt that, everybody who came in to witness it felt that. It had become effortless. TechCrunch: That was definitely something that struck me watching the movie. At the beginning, I saw Michael Fassbender, and it wasn’t a physical change, but the movie made me feel by the end of it that I didn’t see him at all, I just saw Steve Jobs, or at least the Steve Jobs character. Sorkin: I felt the exact same way. We never were interested in a physical impersonation of Steve Jobs. It didn’t trouble us at all that Michael doesn’t really resemble Steve, but something happens in the third act, where we’re not doing any makeup tricks or anything, where he suddenly does look like Steve Jobs. Boyle: It’s wonderful and you get it with Woz, as well. Seth [Rogen] doesn’t really look like Woz at all, but there’s something essentially Woz-like about him that’s really amazing. I don’t know what it is, or maybe it’s the fact that Seth is a comic genius — I mean, he is. And yet he’s also a very decent man, and that’s that Woz thing, isn’t it? The two can sit happily side by side. Sorkin: He’s a terrific actor. He should have more opportunities to play serious roles. TechCrunch: One other line that I really liked was this recurring back-and-forth between Jobs and Wozniak about whether or not computers are like paintings. I’m curious, do you feel that Jobs was able to infuse a kind of artistic sensibility, a humanistic sensibility into technology, as he claimed? Sorkin: Yeah, he has to have been. One of the things that surprised me — it would have come as much of less of a surprise to you — but when I started this, I went online and saw the different fan sites for Apple, for the Mac, and the sort of virtual fistfights that would break out between the people who love Apple and the people who hate Apple, the Samsung fans [laughs]. I’ve only experienced that as a Yankee fan with the Red Sox. These products do inspire emotion in people. And that, I do believe, is Steve, not the technology. Listen, [picks up my iPhone] none of it would have mattered had these not been fantastic pieces of technology, and Steve understood, as he put it, what an A player is. He only wanted to work with A players. But he also looked down his nose at the Newton because he understood that what was next was touchscreen technology and he just skipped over the stylus. That’s not next. Boyle: And also, one of the things I remember was that we, the creative industries, were his target; we’re his gateway to the rest of the world. Because we made them feel cool. The appeal was to us, and it was us going, “Forget those PCs, this is so intuitive.” Without knowing it, we were selling it to those PC people. Sorkin: We were. We loved it, we wanted it, and I think it also gave people who had never really explored being creative the feeling like, “If I get this machine, I can paint something, I can write something, I can write music, there are all kinds of things I can do. I know I want it on my desk; I know when people come into my apartment, I want them to see that.” It’s not ostentatious wealth or anything. It did say something about you.